It’s not often you get to say you’re 'living the dream’, but when it comes to wanting a waterside wedding for your big day, it may be easier to arrange than you think. After falling in love and traveling the world together, Hannah (from England) and Junta (from Japan) began their love affair with Australia's relaxed lifestyle, wide open spaces and the unspoilt beauty of it's sandy beaches. They now call Sydney home and who could blame them! Sydney’s northern beaches boast some of the most beautiful locations you could ever wish to visit. With this forming the backdrop for their wedding weekend, Hannah and Junta chose to set up their home away from home in the seaside suburb of Avalon Beach, just over an hour's drive from the hustle and bustle of Sydney’s CBD. For the price of one night in a fancy city hotel, they were able to book an impressive 5 bedroom private home overlooking the bay. This meant they had plenty of space for their wedding party and visiting family from overseas to relax and prepare for the big day. The beautifully soft natural light from the large bay windows made makeup application easy and created perfect conditions for some flattering photos. Hannah’s dress was elegantly simple and perfectly suited the light and breezy aesthetic of a waterside wedding. With so many of their guests arriving from overseas, Hannah and Junta placed great importance on prioritising the precious time they had to spend with family and friends. Their schedule was carefully paced so as to not feel rushed, which set a lovely relaxed tone for the whole day. Preparations were now complete and after a quick toast, everyone was ready. Hannah and her wedding party were all set to travel to the venue in style… but more on that later. 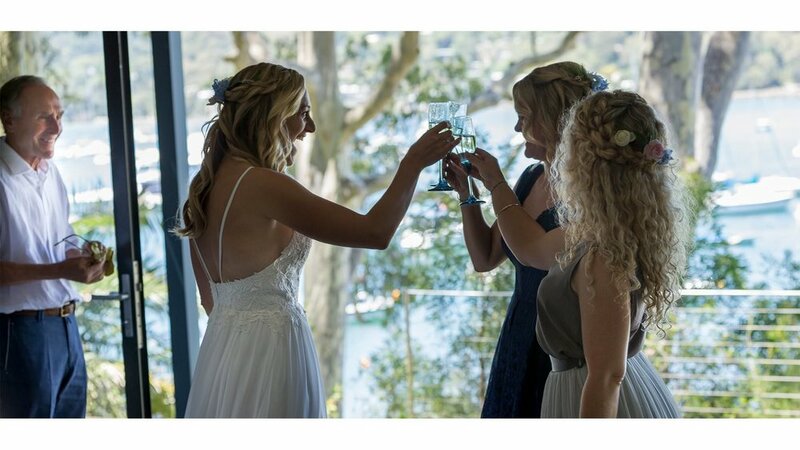 Nestled in a sheltered bay along Pittwater road is the beautiful, modest hall and clubhouse of the Bayview Yacht Racing Association (BYRA), not your ordinary wedding reception venue. During the week it’s home to sailing lessons and it's members, and on weekends transforms into an intimate dinning hall. Built in the 1950s, the BYRA clubhouse maintains much of it’s original assembly-hall charm and boasts the notable modern addition of a large solid timber deck which affords visitors a glorious and uninterrupted view of the bay and surrounding bushland. Hannah and Junta’s reception room was drenched in natural light with a quintessentially Australian indoor/outdoor feel. They transformed the space into something personal and magical, which transitioned beautifully as the day faded into night. 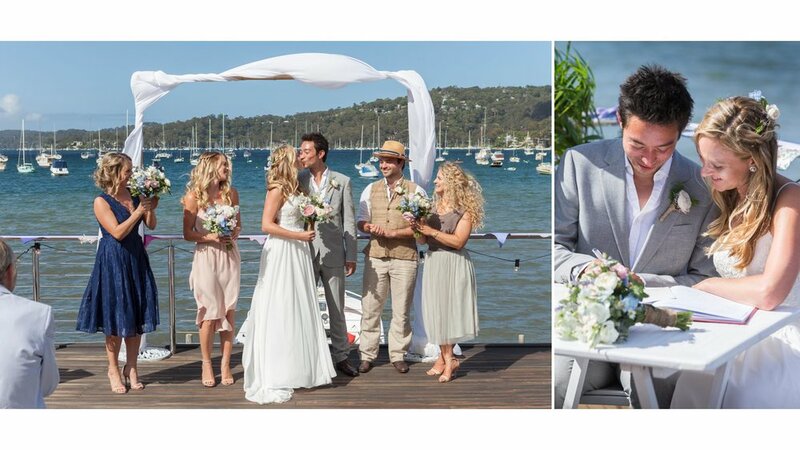 Hannah set the scene by arriving at her waterside wedding by boat. The 20 minute journey from Avalon to Bayview takes in some of the most picturesque and untouched views the northern beaches has to offer and was a perfect way to spend a few quiet moments with her father before the ceremony. After arriving at the marina, Hannah and her wedding party strolled along the water’s edge to the ceremony. Anticipation for their arrival built as Junta and the guests were able to watch them approach, taking walking down the aisle to an epic new level! If there was ever a style of music to fit such an occasion, it’s Jazz. What could be better than having your own private band, on your own private deck, overlooking views of the bay, on such a special day. It’s hard not to be impressed by the simplicity and elegance of what Hannah and Junta achieved in arranging the setting for where their vows would take place. A simple square arch, adorned with white material billowing in the breeze like a ship’s sail, set against a backdrop of expansive blue sky and an occasional cloud, while white yachts gently bob on the glittering glassy water. Most people would say it’s important to have photos recording their important day, but there is a line where this can stop you from being in the moment. Hannah had recently been a guest at a wedding where the photographer had the couple walk down the aisle again after they were married so he could ‘get the shot’. As a result of this horror story, she was adamant that her photography should not interfere with or impact on the natural flow of the day. I couldn’t agree with her more! 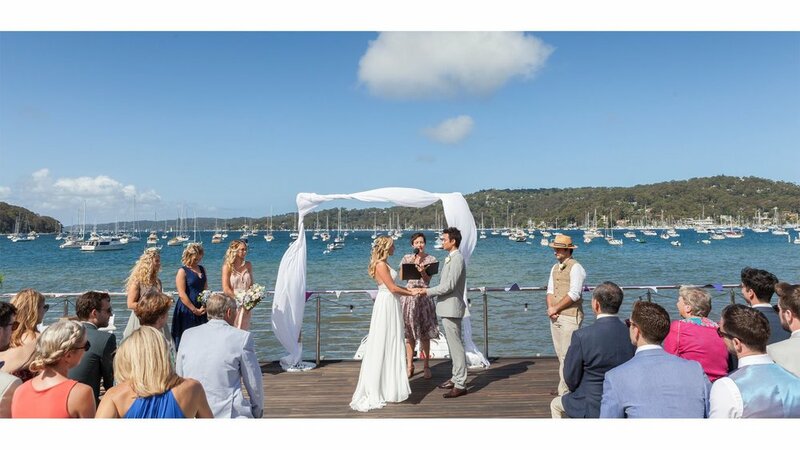 As their ceremony took place on the timber deck outside the hall, there was no standing around waiting awkwardly afterwards or filling in time before the party started. Hannah and Junta’s guests were able to start celebrating with them straight away, and the BYRA hall started to feel like their private home for the evening. It’s always hard to leave any party, (especially if it’s yours) so choosing a time to take more formal photographs is an important consideration. Once their guests were settled in, Hannah, Junta and I took a brief 20-30 minutes to explore the nearby surrounds of the BYRA clubhouse to find the perfect location for photos. 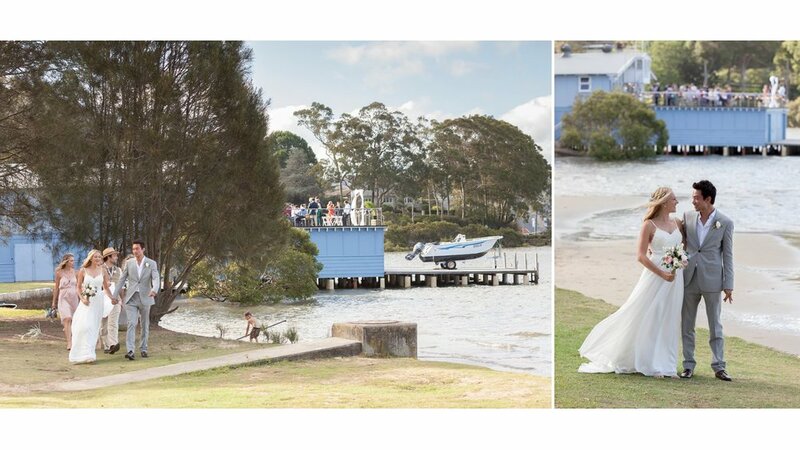 The boat shed, tree filled park and of course the water all provided beautiful settings for capturing images of Hannah and Junta celebrating before they launch into the final chapter of their day. Once back inside the hall, the atmosphere of the party was buzzing with the sound of live music and conversation. Hannah and Junta were able to slip in seamlessly without having missed a beat. When planning your wedding, be sure to consult widely with people who look like they share your style, aesthetic and personality. It may take time, but you'll know when the right ones comes along. If you would prefer to enjoy the company of family & friends, rather than be a prop at a fashion shoot on your wedding day; it feels like my next collaboration could be with you.